Welcome to the beautiful Waikoloa Beach Resort, a tropical oasis amid the dramatic backdrop of virgin, black lava fields. Sense of tranquility and escape is total at Waikoloa Beach Resort Villa that features two bedrooms plus loft, two full bathrooms and accommodates up to six guests. This property is a poolside loft unit. Upon entry to the unit, you will take stairs to the main living area, kitchens, master suite, guest bedroom, bathroom, and washer and dryer. The upstairs loft space is ideal for a little getaway. Inside of this loft, poolside villa is contemporary and comfortable. The tile floor and granite breakfast bar go nicely with the earth tones and other tasteful décor. The open and inviting gourmet kitchen is fully equipped with high-end appliances, breakfast bar with two barstools, and indoor dining area with seats for six. 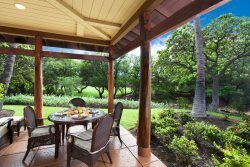 Adjacent to the living room is a covered dining lanai that offers a built-in BBQ grill and a dining table with seats for four. A beautiful master suite features a comfortable king-size bed, flat screen TV and a beautiful bathroom with a deep-soaking bathtub and a separate walk-in shower. The guest bedroom offers a queen-size bed and its own entertainment system with a flat screen TV. The loft features two twin beds and a flat screen TV. There is also air conditioning, complementary assigned parking and complimentary WIFI. For outdoor entertaining there is two swimming pools, two hot tubs, and a fitness center. Waikoloa Beach Villas are an easy to find, perfect island hideaway. The warm breezy courtyard complete with picturesque swaying palms and tropical flowers welcomes you to the doorstep of these polished urban villas. The Beach Villas are located across the street from Queens' MarketPlace and next door to the Kings' Shops, a quaint shopping destination complete with art galleries, a gourmet grocery store, clothing boutiques and some of the best dining available such as Sansei’s Steak and Seafood, Aloha Bar and more. They also have a convenient food court with “upscale fast food” such as Lemon Grass. The beach at Waikoloa, called ‘Anaeho’omalu Bay (or “A-Bay”) offers luxurious sand and shady palm trees with family-friendly water access and activities, and is a short drive from your doorstep. The customer service email responses as well as the maintenance person (James) was great. We have rented over 20 vrbo-type properties in the past, and this condo was the best we've experienced. The property was clean, the responses by the team were lightning-fast, the extras such as beach umbrella, cooler, life vests, beach toys, etc. were a nice surprise. We had plenty of towels and the beds were very comfortable. Kudos! Family of 5 enjoyed our stay immensly. The condo exceeded our expectations. Spacious, with all required amenities and utilities for an enjoyable stay. Close proximity to shops and access to the nearby Hilton was an added bonus. Although I hardly interacted with staff except over the phone or text, everyone that I was in contact with was very friendly and helpful. We stayed in Unit C23 and it was fabulous. Everything we needed was there and we were near the pool which was great! The kids enjoyed sleeping in the loft area and we were thankful that the bedrooms were on the main living area. The only down side to the unit is the entry stairs up to the main floor. Its pretty steep and is quite the hike for a normal person, so it is not recommended for Kupuna or elderly persons. Other then that it was great! We loved the simplicity of booking, checking in and then checking out was just as easy. This place was PERFECT! They have thought of everything! Our stay just wasn't long enough. We were sad to have to leave for sure ad can't wait to come back!